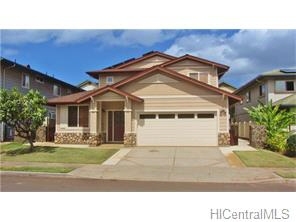 Description: Kapolei knolls - opus model with soaring high ceilings in the great room. Formal dining room and open air family room. This gorgeous home is in move in condition and includes upgrades galore including: 33 panel owned pv solar system with a separate thermal system for the hot water. The patio is covered by a 300 sqft lanai that is accessed by the second floor family room. Central ac, corian counters, terraced rock walls, galvanized metal gates and full appliance package. The knolls features its own park with a playground, walkway on the perimeter and a number of picnic and barbecue stations.